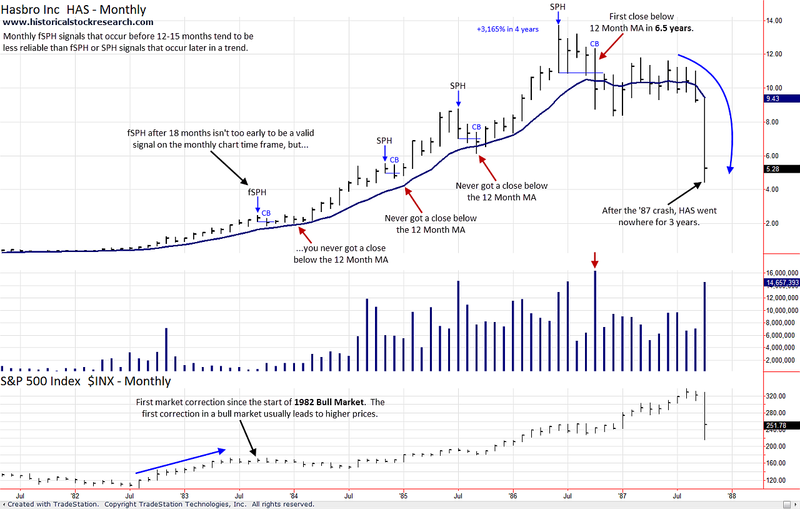 Any distribution or change in direction behavior that's seen on a weekly chart can also be found on a monthly chart. In many cases, a monthly chart will give you a big picture overview and it may even add confluence to other signals seen on lower time frames. Also, because monthly chart signals take longer to develop, they can be less prone to whipsaws. Price closes below the 12 Month MA for the first time since beginning its uptrend. Price closes below the low of the high month for the first time since beginning its uptrend. Using each signal by itself may help you spot tops in stocks, but combining both can be helpful in minimizing ill-timed exits due to false signals. Of course, there may be a trade-off. Exiting solely on a fSPH signal can get you out of a topping stock earlier, but it may also make you more susceptible to false signals. When a fSPH signal fails, price confirms a fSPH, but then goes back to new highs without confirming the first close below the 12 Month MA. Did you notice how the monthly chart set up is very similar to the fSPH signal on the weekly chart? In both time frames, the addition of a moving average gives you more confluence.